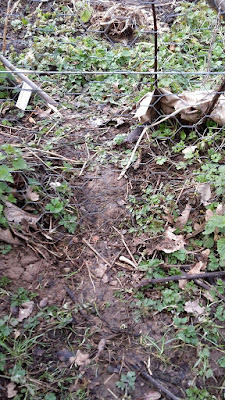 Well yesterday I manage to find out how those pesky rabbits had managed to get into the garden the other day. I spotted a game trail going across the garden next to another damaged tree. 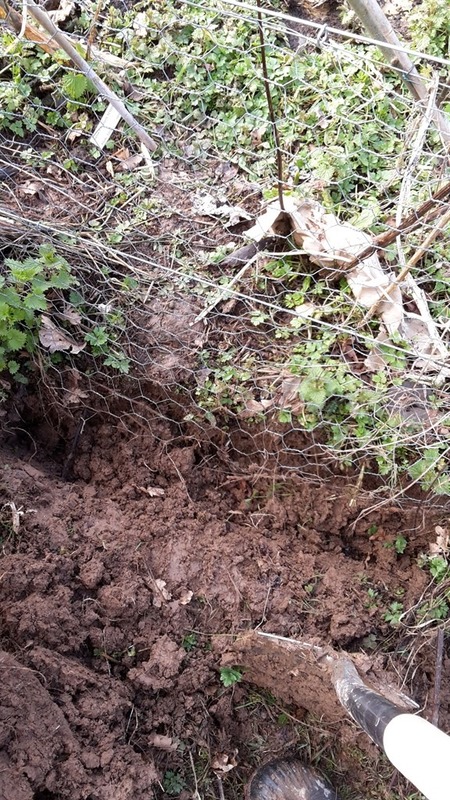 The most annoying thing is that the trail seems to go under the wire, but four years ago when I put this wire in, I spent a lot of time digging it into the ground a good foot or so so the rabbits couldn't dig underneath it. The trouble is it's rotted off at ground level. So far it only seems to be one section but I'm more than a little disappointed with the galvanised wire that I bought. I always thought that the posts would give out long before the wire. 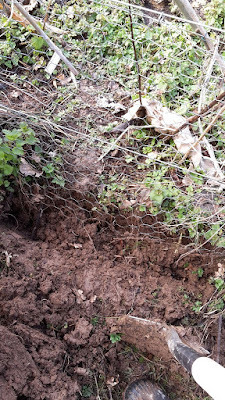 So I did a repair on the fence, digging in some more wire and attaching it to the old wire. 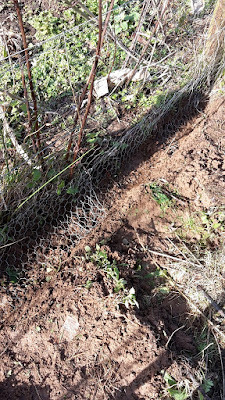 I'll have to keep an eye on the rest of the wire now as well, I'll probably only realise I have another problem when I see more rabbit damage. 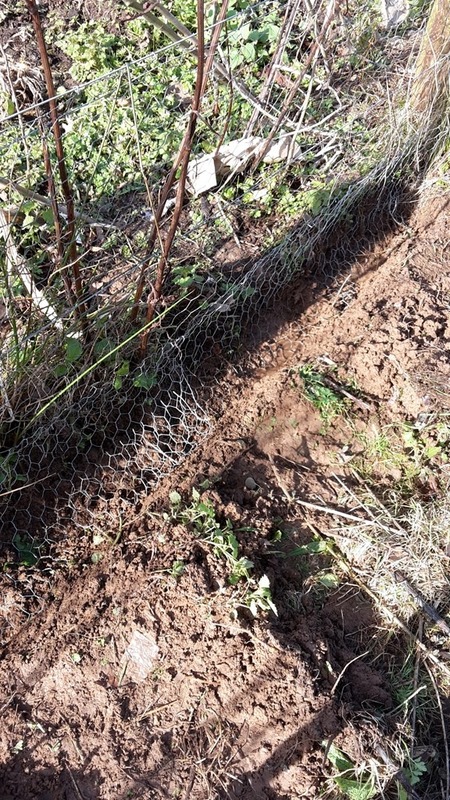 Anyone know a solution for stopping wire rotting off like this or have a better solution for a rabbit proof fence. Maybe if I ever get all my other jobs finished I'll build a wall around the garden! I'd be better than Mr McGregor though as I'd make sure I ate the buggers! I would also say plastic coated as well. Hadn't realised galvanised would rot, how odd! I'd think plastic coated would be worse, but I've no idea why I think that! Wow, wood would have lasted that long, they must not have treated the wire before galvanizing it, kind of like the cars back in the 70s, they almost rusted on the dealer's lot. A stone border might help, depends on how much fence you have of course. We have rabbits but I haven't seen them mess with anything, your bunnies must be more hungry, same with deer, they have too much in the wild areas to eat. It's quite a big fence. That's why I think i'll keep repairing it for now. I am tempted to put a chicken run all the way around the outside to keep the weeds and pests down, but I doubt I'll get round to it! The only thing I can think of is to dig down and put down cement ( we did quikcrete ) to keep my dogs from digging. It worked well. We are probably going to do it here at our new house, I have found two spots made by the raccoons. Yeah, that would be ideal but there is quite a perimeter around the outside so it would be a lot of work. Leave the hole and set a wire snare at the spot. You'll have supper without needing to pull a trigger. I couldn't find my snares so I'm going to order some more. That was my first thought as well. That or a drop box. Build some box traps and EAT the little devils! I did think about a drop box but just didn't have the time to do it. I think snares might come into play at some point if it carries on. How about spreading a few old, out of date, vegetable seeds on their side of the fence? 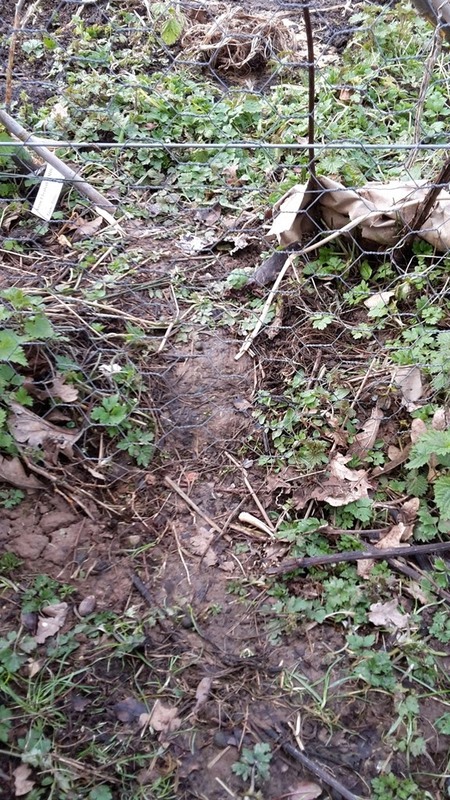 My experience has been that the thin rabbit wire can be eaten away in a year or less if the ground stays moist. Its just too thin. I have even seen 12 ga. wire rust away in two years when it's underground here. We can get a thicker grade of wire. I don't dig it in though. For the fence around my garden it just comes down to ground level and then I have small logs and rocks all around the perimeter. This keeps out the rabbits and the bandicoots and the wallabies!